On December 22, 2017, President Trump signed into law the Tax Cuts and Jobs Act of 2017 (P.L. 115-97). The Act represents the most sweeping tax legislation in 30 years and will affect nearly every individual, business owner, and corporate taxpayer in the United States. 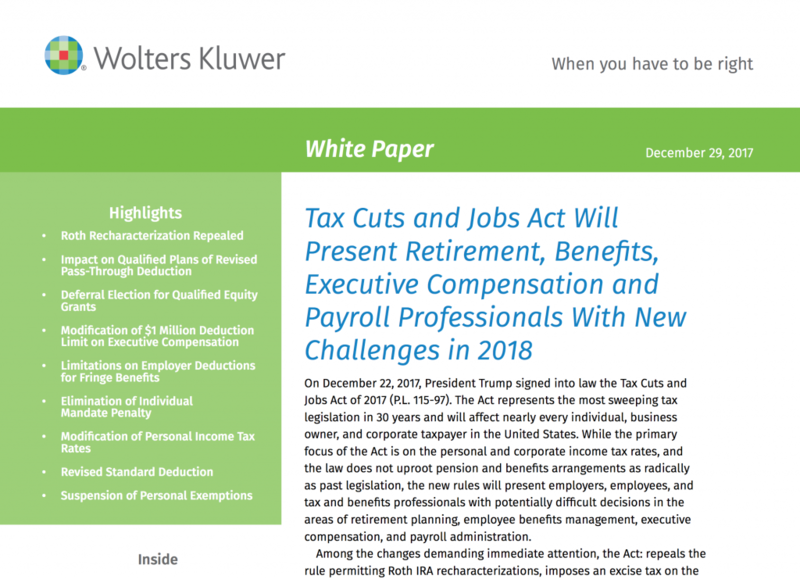 While the primary focus of the Act is on the personal and corporate income tax rates, and the law does not uproot pension and bene ts arrangements as radically as past legislation, the new rules will present employers, employees, and tax and bene ts professionals with potentially dif cult decisions in the areas of retirement planning, employee bene ts management, executive compensation, and payroll administration. Click the picture to read full online version.